Over The Moon offers a variety of classes to encourage creativity, exploration and self-expression in babies, toddlers and preschoolers. Come play, sing, dance, and create with your little one! Created by Zumba® and BabyFirst for kids ages 4 years old and under, the Zumbini® program combines music, dance and educational tools for 45 minutes of can’t-stop, won’t-stop bonding, learning, and fun! Music boosts memory development and improves language, motor skills, self-expression, body communication, fluid intelligence. You and your baby are invited to join us for this happy, engaging music class incorporating musical instruments, movement and fun! Sensory fun for your little one! From toes in the sand to splashing in water, babies find out about the world around them using all of their senses. This sensory art class encourages your little Leonardo to pop, squish, paint, feel, smell, sculpt, and more! Nurture your little one’s creativity and self confidence, and develop their investigative and fine motor skills with art! Find a class: Check the listings below for details and rates. Questions: Call the center M-F, 9am - 2pm (781) 347-3189. You and your child are invited to join us for this happy, engaging music class incorporating musical instruments, movement and fun! Research has consistently shown that experiencing music taps into all categories of development for kids. All humans benefit from music in the area of memory but young children can use it as a tool to become more adept at improving language, improving motor skills, and self-expression. Listening to and playing music helps the body communicate more efficiently and can bring a huge boost to fluid intelligence. Don’t see a signup button? Feel free to call the Center Monday–Friday, 9:00 – 2:00, at 781-347-3189 and we can help you find a class. Created by Zumba® and BabyFirst for kids ages 4 years old and under, the Zumbini® program combines music, dance and educational tools for 45 minutes of can’t-stop, won’t-stop bonding, learning, and fun! Learn about Zumbini on their website, or you can also watch the Zumbini TV show which airs on Baby first TV everyday. Registering 2 or more of your children? Call us at 781-347-3189 for a discounted rate. Sensory fun for your little one! From toes in the sand to splashing in water, babies find out about the world around them using all of their senses. This sensory exploration class will provide you with lots of baby-safe ideas for hands-on exploring and tactile investigating. Babies will enjoy exploring different textures (sticky, soft, scratchy! ), safe-to-taste paints & doughs, water, instruments and more. Class begins with a brief music and movement circle time, followed by free -play among several sensory stations which all relate to the day’s theme. You and your child will get very messy in this class! Please dress accordingly. Your little dipper will dabble in art AND music! This 45-minute class will start with you and your child moving and signing along to traditional children’s music…all based on the day’s theme. This will be followed by multiple creative art and sensory exploration stations await. Your child will paint on the floor and walls, make giant murals with various materials, play with water and sand, and much more! While your child is busy playing and exploring, he or she will be practicing important fine motor, cognitive and social skills. Some of this session’s exciting themes include: Luck of the Irish, Pizza Party, Barnyard Babies, and April Showers. We can’t wait to create and sing with you! Notes: *Due to the nature of this class and the materials used, we are not able to accommodate all food allergies and sensitivities. Please contact us with questions. Join us for our popular Baby Paint Night! This special experience led by Melissa Breen is created for painters ages 9 to 36 months and their loving caregiver. Each child will create a colorful canvas to bring home. No worries about your baby following instructions! All he needs to do is have fun exploring the paint* with his hands or variety of brushes provided. 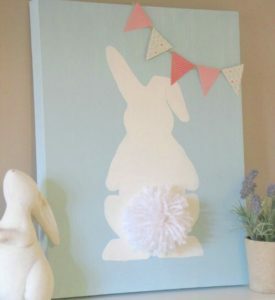 Your child’s seasonal art canvas will magically reveal itself when he or she is done exploring! Painting and water play in the classroom will be followed by a half hour of free play and socializing in our Play Zone and cafe. For ages 9 to 36 months and caregiver. *Paint is non-toxic, safe-to-taste! If you love Baby Paint Night, see more of our art and music classes for your babies and toddlers, here.